This is only my second crochet project ever. I find that crocheting makes my elbow and arm hurt--maybe I’m getting old, lol. On the other hand, maybe I keep too tight a grip on the hook. The fabric of this doesn’t look as pliable as the one in the photo from the pattern download, perhaps because I’m using acrylic/nylon yarn instead of the wool it called for. I’m working within the gauge they prescribe, but maybe I shouldn’t worry so much about gauge, since it’s a blanket, and try to be more comfortable with the hook. 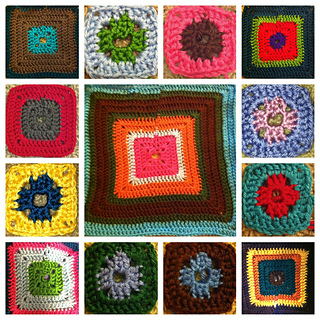 UPDATE: So, I changed some of the colorways and yarns after making one square (a 12-round square, with several colors). First, it looked too dark, too somber, compared to the original in the pattern photo. Granted, the first square has darker colors, but I wasn’t satisfied. I changed the red (C) to a brighter red, not exactly the tomato red the pattern calls for, but a candy apple kind of red (Caron Simply Soft). After re-doing the first square, I am much more satisfied with the new red. 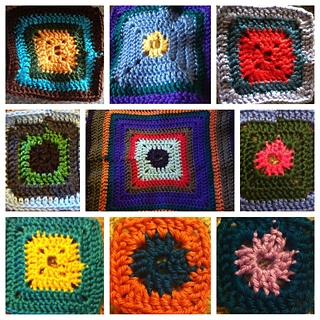 The darker looked good in the smaller (not finished) version of the square, but the brighter looks better in the finished square (sorry, pics removed to show newer squares). Maybe I will alternate them, depending on the square. 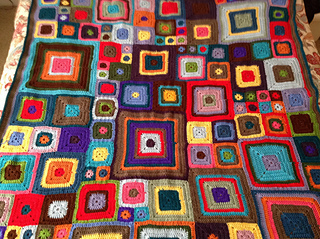 With the darker one, the finished square looked like a granny square from the 1970s, not something from the bright Koigu blanket that I fell in love with. Second, I found a different blue to stand in for Koigu’s bird’s egg blue. The one on the Koigu website looks like pale green, so I got one similar to that (O), but after looking at pics on the pattern more closely, it is a medium blue, so I have another option for that one. Third, I haven’t been happy with the feeling of the Impeccable yarn, the dark purple (F). 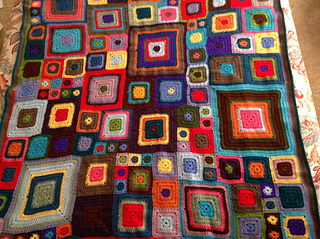 Compared to the Caron’s and the Red Heart Soft, it is less pliable and more scratchy, not pleasant to work with, IMHO. 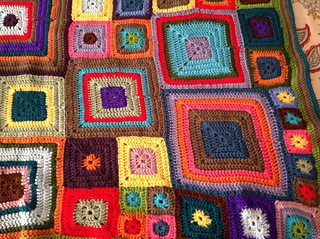 I liked it when I used it last year as the edging/piping on a crocheted shawl (see MOther Nature shawl). It was good because it is a little tougher and I wanted that in order for the project to hold its shape. It’s not so great when partnered equally with the other yarns I have. 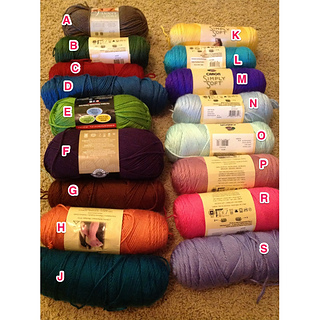 SO, I bought a deep purple in Vanna’s Choice and will try it on the next square that calls for purple. I am pleased with the Taupe Vanna’s Choice and the Red Heart Soft, so far.